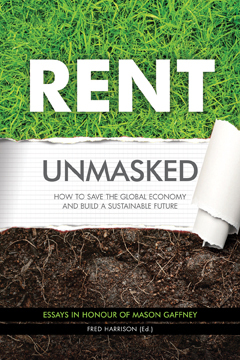 Rent Unmasked has been chosen for the Winter 2016/17 heat of The People’s Book Prize for Non-Fiction. This competition is based purely on public votes – so we need your help. Successful books from the heats are entered into the final, which occurs annually. Rent Unmasked was published in 2016. It is a collection of essays in honour of Mason Gaffney edited by Fred Harrison. The authors are drawn from the legal and property professions and from universities around the world. A number of readers have already voted for the book. Many thanks! As part of the voting process, readers can add an optional comment about their chosen book. Below are just a few of the wonderful comments which Rent Unmasked has received since voting opened. If you have enjoyed Rent Unmasked and are a fan of Ethical Economics, Mason Gaffney, Fred Harrison or Land Value Taxation then please vote for the book in The People’s Book Prize before the end of February 2017. Thank you from all at Shepheard-Walwyn.